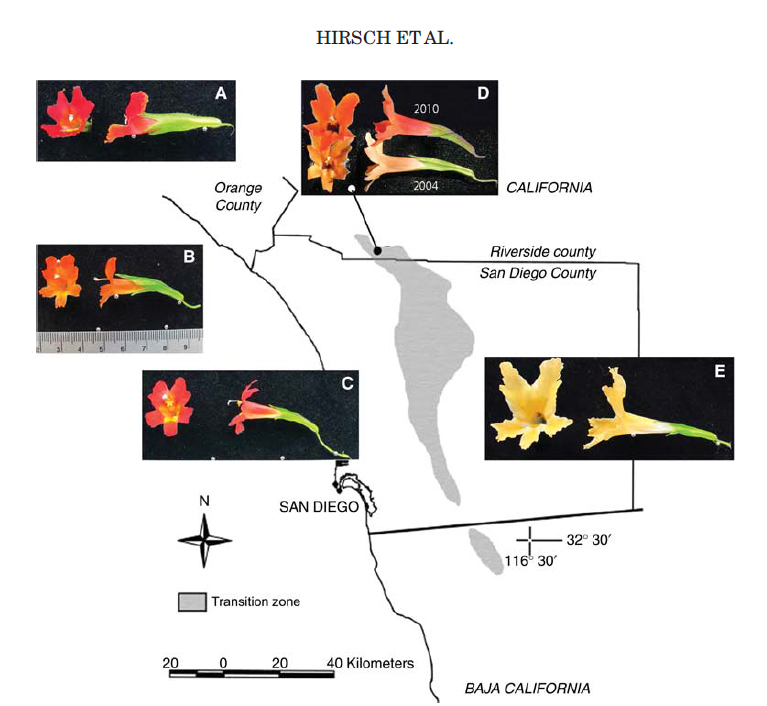 Rolf Baumberger, from the University of Zurich, has studied the sticky monkeyflower, Diplacus puniceus (formerly Mimulus aurantiacus) at SMER for over two decades. An individual plant can switch from a yellow, insect-pollinated flowers to red, bird-pollinated flowers over the course of its lifetime. This transition is not reversible, and is passed on to its progeny, and so it must be caused by an epigenetic change in response to a cue in the environment, such as pollinator availability. Epigenetic changes, such as DNA methylation, alter expression of genes and an organism’s phenotype without an actual change to the genetic code. Rolf still visits the reserve, and can sometimes be seen on his scooter on the dirt roads of SMER, but he has been able to do much of his work using HPWREN cameras, though a collaboration between SDSU and UCSD. in Plant Populations. Cold Spring Harbor Symposia on Quantitative Biology, Volume LXXVII. The red flower phenotype appears to be spreading, possibly due to expansion of hummingbird populations.